Is this is the worst car salesperson ever? We all come across car salespeople who are less than perfect at one point. Maybe you have had to deal with one who is too pushy, doesn’t answer your questions directly or just isn’t very good at their job. These are all pretty annoying traits for anyone who works in the car trade but at least you aren’t likely to have encountered a blow up doll trying to sell you a battered old vehicle. Unless you have been looking at an old VW Golf for sale on eBay lately, that is. 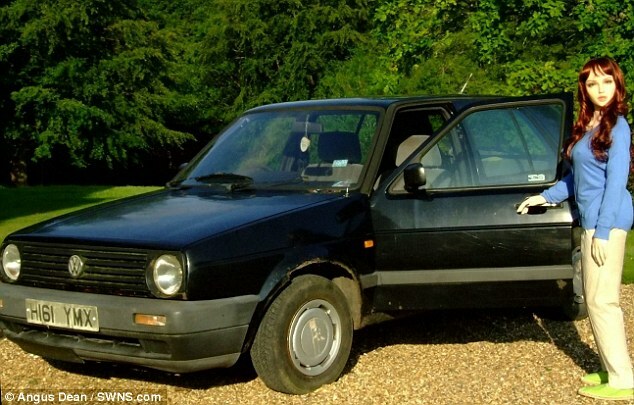 An enterprising chap called Angus Dean decided that the time was right to sell his 1990 Golf. If I’m being brutally honest here, it doesn’t look all that great. I don’t think that Angus will mind me saying that, as he clearly thought something similar. Realising that the car wasn’t going to attract a buyer very easily he did what any sane, well balanced person would have done; he took pictures of it with a blow up doll posing beside it. The doll is called Sandy and apparently she belongs to a friend of Angus’. I have no idea what her day job is when she isn’t kneeling beside old cars or sitting inside them but I assume that she is better at it than at this. The question I really have to ask is whether you think that Sandy is the worst car salesperson you have ever seen. Did you she maybe make you laugh a little but generate no interest in your mind about buying the car? Perhaps you’ve met a worst car salesperson at some point. It might even have been a human one rather than an inflatable one. If so, did you buy a car off them or did you get away from there as fast as possible? Would you buy a car off Sandy? Would You Sell Your Private Parts to Afford a Car? This entry was posted in Humour, Musings, News and Views and tagged car salesperson, ebay, funny car ad, vw golf by Robert Bell. Bookmark the permalink.